Here’s the first thing you need to know about Twitter: no one “gets it” in the beginning. If you’re new to Twitter, it’s unlikely that you will intuitively grasp how to properly and effectively use this social media tool right off the bat. But every week, over a billion tweets flow through Twitter exploring every imaginable subject and a wide variety of writers are using Twitter to make their presence known. There’s some work involved, but it’s doable. The second thing you need to know about Twitter– your readers, your clients, your audience is already on Twitter. Are you willing to miss the opportunity to be part of the conversation? Let’s start with the basics. But before diving in, take a breath, and remember that everyone starts at zero. Tweets are composed of 140 characters or less, and are the method you use to communicate on Twitter. It may take a little time to get used to, but there is little that’s not achievable, even within these limits. Lets take a look and define some components of a Tweet. Hashtag – A Hashtag is any word beginning with the # sign (an example might be #writer). It is a way to categorize messages to help them show more easily in Twitter search. You can use Hashtags to organize conversations around a particular topic, to group people, target people, meet people with a similar interest, get info on a topic or to follow current trends. When you click on a Hashtag you are taken to the search results for that term. Retweet – A Retweet is someone else’s Tweet that you choose to share with your followers. Just hit the Retweet button to send the original message to all of your followers. However, if you wish to add your own commentary to the original Tweet, then you must manually Retweet the content by copying and pasting it into a new Tweet of your own. You must add the letters RT and the Tweet author’s @username to show that it’s a Retweet and isn’t your own content. An added bonus, is that the Retweet done manually shows up in the original Tweet author’s mentions section (see below); this brings you to their attention and might even encourage them to follow you. Links – Twitter’s link shortening feature lets you paste a link of any length into the Tweet box and it will automagically be shortened to 19 characters! This makes it easy to fit long URLs into the 140 character limit. Mention – If you want to bring a Tweet to someone’s attention, and still allow all your followers to see the message, use a mention. Include the @username of whomever you want to mention in your tweet, and it will appear in the mentions section. All @username mentions are clickable and link back to the profile of the person or business mentioned. 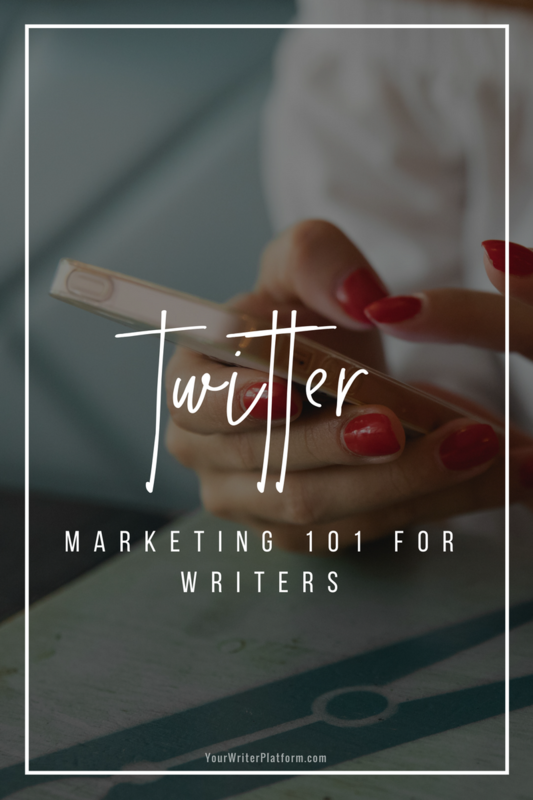 So now that you have the basics of what makes up a Tweet, lets take a look at how best to utilize this social media tool to build relationships and grow your writer platform. But remember, ‘marketing’ isn’t shorthand for shameless self-promotion. By following this guide, you can use Twitter as a way to gain connections all over the world. Used effectively, it will help you stand out and get noticed. If you have not yet set up your Twitter account, read through the tips below and then visit Twitter.com to set up your new account. (If you are still baffled or want more help on setting up your account, check out Rafe Needleman’s Newbie’s Guide to Twitter). Tweak your profile; be remarkable. Since your goal is to get people to follow you, you must make it appealing for them to do so. Your profile picture, your bio and your Twitter background are prime marketing real estate, so use these areas wisely. If your name is taken, try adding ‘writes, books, or author’ to your name if space allows. Eg., JaneDoeWrites. Make sure that it’s professional, high resolution and looks good even as a thumbnail. Keep your author or business brand in mind and use the same picture across all your social media profiles. Don’t use a book cover, no matter how proud you are of it. It’s social media; people want to connect with you, not your book. This holds true for freelance writers too. There are better places to utilize your logo and other branding, which we’ll talk about shortly. Change your header photo or image. UPDATE: Twitter has made some changes (again! ), so for more on the recent updates, check out this post by Andrea Vahl. This is not a must, but changing the header image can reinforce your branding or add a little personality to your profile. The header image is more important on mobile devices, such as your phone, as your Twitter background isn’t displayed. Changing your header image is just as easy as adding your profile picture. Go to Settings–>Profile and Change Header. In the bio area, you have limited characters to explain who you are and capture attention, so be innovative! Include something personal about you–a trait, a passion, a vision, a talent–as well as work/industry related keywords. If you’ve fine tuned your website tagline, you could also add it to your bio. Twitter provides the option to link directly to your site from their site. By entering your URL (http://www.yourdomain.com) in the option box, you will get a back link into your site that followers can see in your profile area and have one click access to your site. You can also include another link in your bio. In either case, make sure you start the URL with http:// which will make your link live. Change your Twitter background design. Every Twitter account has the option to change the background image that comes standard with the account. Instead of using any of the backgrounds Twitter provides, create your own background and upload it by clicking the gear in the top right corner, Settings–>Design. Utilize this space. Some things you might want to include: a photo of your book(s), your logo and tag line, your website URL, email address, usernames to other social media sites or even a favorite quote. Get creative! Remember to keep your brand in mind and use your Twitter background to help reinforce your message. To access this go to Settings–>Design, scroll down to Customize Your Own and upload your design. Tip: change your link color to coordinate with your newly uploaded design. 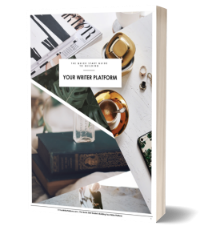 You can check out the Twitter profile for Your Writer Platform (@writerplatform) for some ideas. So now your Twitter account is set and tweaked and you’re poised and ready to post your first Tweet. Umm… What do you Tweet about? Share useful, helpful and interesting industry related content with your followers by linking to other blog posts and articles in your genre or area of expertise. Be you. Reflect who you are and be transparent and authentic. Start a dialogue, ask questions, interact with others. Be fun and engaging! Let people know there is a real person behind the book or freelance business that engages in meaningful conversations. Add photos and quotes. Post funny or informational videos that pertain to the industry or your particular niche/genre. Post breaking news or trending topics. Post the results from surveys and polls. People love to see how things turned out! Retweet appealing Tweets from other users. Use your Tweets to create buzz for a new “secret” book, a launch or appearance to be announced. Get them waiting and looking for information. Introduce your new book or freelance service. Let your followers know when you are offering a discount or promo. Over promote. Keep the 80/20 rule in mind. Only about 20% of your posts should be self-serving. The other 80% should be for your audience’s benefit. Re-post someone’s good content without giving them credit. The best time to post will obviously be when the majority of your followers are online. To find this out you can use the third party Twitter tool Tweriod. Once you’ve discovered when your followers are online, you can use Buffer or Hootsuite to schedule your Tweets to be sent at optimal times. For a great explanation of the benefits of Tweriod and Buffer, check out this post from Pat Flynn of the Smart Passive Income Blog. I use Hootsuite (free for a basic membership) so I can schedule my Tweets in advance and avoid having to hang out on Twitter all day. Hootsuite also allows you to easily track mentions of your name and book title so you can always stay involved in the conversation. Another bonus is that Hootsuite has a link share tool (Hootlet) that easily allows you to Tweet from any page you’re visiting and automatically grabs the title and URL, including it in your tweet. Easy peasy! By using some of the above third party applications, you can limit the amount of time that Twitter swipes from your day – and your writing schedule. Give yourself a time limit and 10 to 15 minutes once or twice a day. That’s all you should need in order to use it effectively and efficiently. When it comes to finding and increasing your followers, the first step is to find like minded individuals whom you find interesting and whose content you enjoy. The next, is to employ some strategies and basic Twitter etiquette to identify those people who you could and should be following. Find your “competitors”or other Tweeter’s in your niche–author’s in your genre, freelancers, bloggers or agents–and click on their followers list. Start following that list. If you are Tweeting about similar topics, logic dictates that their followers will likely be interested in following you too. Organically, people will follow you based on the great content you are posting (eventually this will be the main way that you get followers). By directing people to your Twitter profile and inviting them to join you. By having a Twitter icon on your author blog/website that says “Follow me”. To avoid looking like a spammer, you should be careful to have approximately the same number of people following you as you follow. Even better is to have more followers than people you follow. Also keep in mind that once you are following around 2,000 people, your ability to follow more people will be restricted by the number of followers you have. A good way to keep your following count under control is to use JustUnfollow.com. You can ‘unfollow’ up to 25 people per day (for free) who opt not to follow you back. Most people who will follow you back, will invariably do so within a week to ten days. So in order to make room for new people to follow, you can unfollow those who have not followed you after a week. You may also want to remove those people who haven’t Tweeted for a period of time (dormant accounts) or those with no profile picture (less likely to be a real person). Using hashtags wisely in your Tweets will get you more exposure with the right people by making your Tweets more visible. A hashtag is essentially a link that is searchable by other users and helps categorize the gazillion Tweets that are being pumped out every minute. Don’t overuse hashtags in a post. Keep it to 1 or 2 per post. Do use hashtags in your posts. When you copy over a title of an article to post on Twitter, pick a keyword that is already in the title and add a hashtag. Do not include any spaces or hyphens or it won’t work. Laura Pepper Wu at 30 Day Books provides a great list of useful hashtags for authors and writers. This is a lot of information to digest, and it may be best to bookmark this post and refer back to it while you work on your Twitter strategy. Try not to get overwhelmed! Break the process down into smaller parts, and tackle each section one at a time. The key is to understand that Twitter is just a tool that amplifies your local cafe chatter. Don’t be intimidated! Any questions or concerns about using Twitter in your marketing strategy? Anything to add? Thanks, Kimberly. I’ve been on Twitter for awhile, but have learned all kinds of tips from your article. I’ve always felt that there was more I could do with Twitter and now I have some ideas and methods. I’m one of those introverted writers that can sometimes find social media a little intimidating. I appreciate all the information here …. definitely bookmarking for future reference. Found you on the Link Party and LOVE your blog! This is exactly why I’ve started my blog, and can’t wait to read through your posts for some great tips. Love this post on Twitter, which for some reason has been difficult for me to grasp. I think this will really help me in gaining followers and using it to its full potential. Thanks! Thanks, Meg! Glad you found your way here! Twitter was difficult for me too, at first. I just couldn’t get a handle on the ‘language’. Now, I have to actually time myself so I don’t spend half the morning ‘chatting’ with new friends and connections! Don’t worry, it will come together for you too. Thanks for the excellent advice! I’ve been on Twitter a little over a week, and your post gave me a much better understanding of the following etiquette and what to expect. Just keep at it; it gets much easier over time! You use hashtags to expose your Tweets to a wider audience, Mohit. Try Hashtags.org to research popular hashtags to use with your Tweets. Love this article. I wish I’d had this years ago when I started marketing for my Best Selling Technology Author/husband. I was flying by the seat of my pants and have, for the most part, neglected Twitter. In my defense he went from having written only 5 books when I met him, to over 20 now so my job has grown, to say the least. I have some friends who have just published their first books. I will gladly refer them to this article. Thanks, again for keeping it simple. Glad to be of help, Becky, and I appreciate you sharing the post. Sounds like you have your work cut out for you, but I would imagine you have a fair bit of momentum on your side now after 20+ books! Yes, and promoting Peter’s work is an easy sell because he is a quality, and in-demand writer; however, I am always trying to learn and improve. What I would really love is to connect with other women who do what I do. You’d think they were out there but I keep reaching a dead end. Too many women say they would never work with or for their author/husband, or that they’d like to but haven’t. Surely I’m not the only one! I would love to market a package specifically for couple teams. I think we have a lot to offer in the way of advice and what works and what doesn’t. There are other great women in the book marketing/platform building field; here’s a list of a few just off the top of my head: Joanna Penn, Penny Sansevieri, Christina Katz, Toni and Shannon from Duolit self-Publishing, Kristi Hines, Peg Fitzpatrick, and lots more! I wanted to thank you for this article, as well as your response to my email about my following building more slowly than I wanted. It’s been about a month since I started my email list, and about three since I started my Twitter account. My email list is building now, very slowly, but still building like you said. What’s surprised me more, however, is that my Twitter following has really grown this week. What’s more, is that my new Twitter followers are much more focused, either having to do with building platforms or neurological disorders (my nonfiction focus). I appreciate your encouragement through your articles (and email) to continue working through the slow times. It’s beginning to pick up. Absolutely my pleasure, Brittany! Managing expectations is probably the trickiest part to building your platform and your business. Keep learning about your audience – find out what they want and need and figure out the best ways to deliver it to them. Momentum will start to build, and all the work you’re putting in now will pay off soon enough. You’re my internet fairy godmother, I swear! Looks like you’ve got it figured out now, Ken. Were the instructions not clear, or did it just take a bunch of tweaking? Thanks so much for this. I started Twitter last night and tweeted this post to it. I know I need a Platform and Twitter is the first social media site that isn’t intimidating. I have a question though. How does a writer Tweet what they are writing without giving away too much? I have a logline that I want to tweet that gives an idea of the concept. Yet, I’m still weary of making the leap to really get going. As for your question about giving away too much, what are you really worried about? Someone else grabbing your story idea? Or giving away too much info to potential readers? Just found your site, Kimberley. Thank you so much for your generous sharing of information. Very useful as I am in prepublication for my first book and building a platform. My brand has been my blog, A Flourishing Life, but this will change to the title of the new book. Should my twitter handle be the title of the book, which will also be the name of my new website, or my name? I am looking to the future and don’t want to limit myself. i can’t say the title now, but it is a good brand name with a lot of potential for future books as well. I also appreciate your approach to take your time and do it well. I want everything done yesterday! But I know attention to thoughtfulness and detail will pay off. Regarding building your author brand, try to look into the future a few years, and see if the branding you’d like to do now will hold up over time. For authors, using your name is often the simplest and safest bet, but if you think your book title will also work as a brand or business name, then my suggestion would be to try and keep everything as consistent as possible on social media platforms as well. If you want to use your name for social media, but have a different site or blog name, that’s ok too, but just make sure that people–who don’t know you–can easily make the connection that you are associated with the site. For example, if your posts are authored by “admin”, your About page has site info only and nothing about you, and the images you use of yourself or your brand on social media are nowhere to be found on your website, people will not be able to make the connection. then complete strangers should be able to put it all together. For more direction on this, check out this post: Discover and Build Your Author Brand. Super helpful, Kim. Thanks so much! I’ve been TERRIFIED by twitter for years. Everyone said ‘Just join and start tweeting’ but I had no idea what to do!!! What was the dreaded hash tag for? At last a post that explains it in words I understand. Kimberly – You’re a lifesaver. Twitter will be my next month’s marketing project. I’ve been putting it off for too long. I felt the same when I first started – Twitter made absolutely no sense, and I couldn’t imagine how anybody could benefit from learning obscure “Twitter-ese”. Enjoy your Twitter project next month!